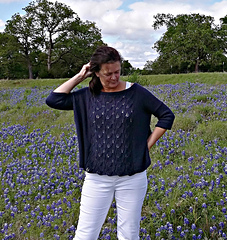 To Fit Bust Size: 30/36 (38/46 - 48/56)"
Spring in Texas is Bluebonnet time! 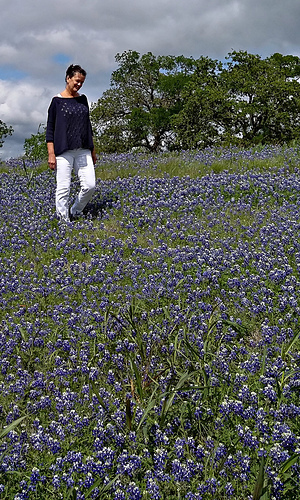 They are massed along the highways and covering fields here in Central Texas thanks to our former First Lady, Lady Bird Johnson. Mrs. Johnson had a vision to make the world better - more “beautiful” - one plant at a time. 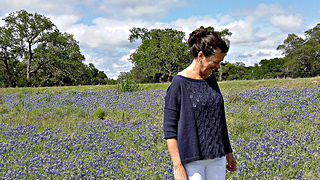 She recognized that wildflowers and other native plants can lift the spirit and that conserving them and using them in our everyday landscapes is critical to our future. She established the Lady Bird Johnson Wildflower Center to realize this dream. 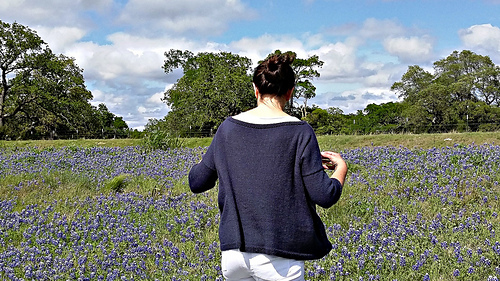 When in Austin be sure to visit! 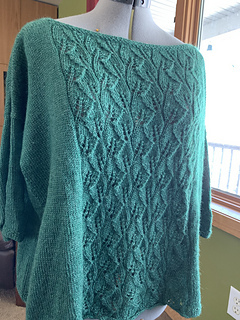 The front and back of the sweater are worked bottom up. 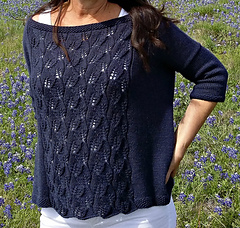 The length is easily adjusted by working fewer repeats of the Leaf Lace Pattern. The three needle bind off method is used for seaming the shoulders. Stitches are picked up for the sleeves and the sleeves are knit from the shoulders down. The Leaf Lace Pattern is worked four times across front for size X-Small/Small and five times across for sizes Medium/Large and 1X/2X. Note: This garment was designed to be oversized with approximately 14 - 22” of ease. Please take this into consideration when selecting your size.